Stock photo of Olympic Flags outside the 2010 Olympic Office along the Village Stroll in Whistler Village with Blackcomb Mountain, blue sky, and sunshine in the background, British Columbia, Canada. 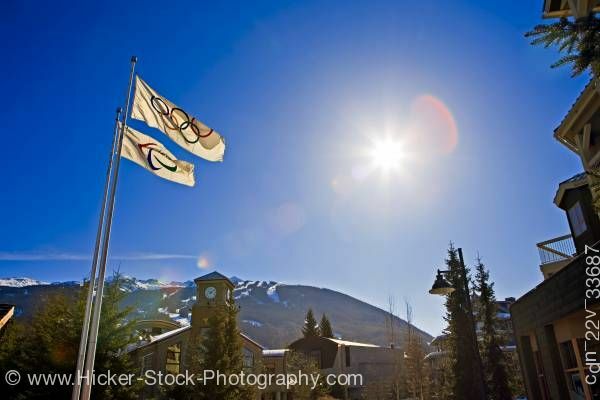 This stock photo includes the Olympic Flags outside the 2010 Olympic Office along the Village Stroll in Whistler Village with Blackcomb Mountain (2440 metres/8000 feet) in the background, British Columbia, Canada. Whistler is a Canadian resort town in the southern Pacific Ranges of the Coast Mountains in the province of British Columbia, Canada, approximately 125 kilometres (78 mi) north of Vancouver. Incorporated as the Resort Municipality of Whistler (RMOW), it has a permanent population of approximately 9,965, plus a larger but rotating "transient" population of workers, typically younger people from beyond BC, notably from Australia and Japan. Over two million people visit Whistler annually, primarily for alpine skiing and mountain biking at Whistler-Blackcomb. Its pedestrian village has won numerous design awards and Whistler has been voted among the top destinations in North America by major ski magazines since the mid-1990s. During the 2010 Winter Olympics, Whistler will host most of the alpine, nordic and sliding events.